The sublime effect of exquisitely chosen materials, perfectly crafted to serve and enhance the human body and soul, makes John Makepeace's work overwhelmingly desirable. 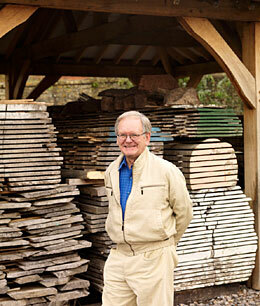 John Makepeace's career has been an adventure in wood. He first saw fine furniture being made when he was eleven, and then he visited the great cabinet makers in Copenhagen as a teenager. Design and craftsmanship came naturally to him. Early professional recognition led to his work as a design consultant to the all India Handicraft Board, a founding member of the Crafts Council in the UK and a Trustee of the V&A, London. Early commissions from Templeton and Keble College, Oxford, Liberty's, Banque Générale du Luxembourg, were followed by major museums, corporate and private collections around the world. The clearance of forests to fuel the Industrial Revolution and the consequent dependence on imported timber prompted the purchase of Hooke Park, the 350 acre woodland nearby. 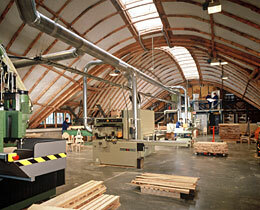 The subsequent European programme of collaborative research explored the improved utilisation of indigenous timber and resulted in a series of award-winning buildings for the new campus. To coincide with the move of the college to Hooke Park in 2000, John Makepeace handed over the reins to a new director, who subsequently oversaw the amalgamation of the college with the Architectural Association. Following the sale of Parnham in 2001, John Makepeace purchased Farrs, a listed house in Beaminster, which had not been sold since it was built in 1730. Here he and his wife, Jennie, now have their home, gardens, design studio, gallery and timber seasoning for current and future commissions. John Makepeace was awarded an OBE in 1988 for services to furniture design and in 2002 received the American Furniture Society's Award of Distinction. In November 2010 he was nominated by the Chartered Society of Designers for the Prince Philip Designers Prize 2010 and received a Special Commendation. John has received Lifetime Achievement Awards from both the American Furniture Society (2004) and the Furniture Makers Company (2010). He is an Honorary Fellow of the Arts University Bournemouth (2009) and of Hereford College of Arts (2013). 'John Makepeace: Enriching the Language of Furniture' was the subject of a national tour sponsored by the Arts Council between September 2010 and November 2011. John's work was included in two Victoria & Albert Museum exhibitions in 2012: 'The Power of Making' and 'British Design 1948-2012 - Innovation in the Modern Age'.